Introduction to Digital Preservation: Why Preserve? How to Preserve? 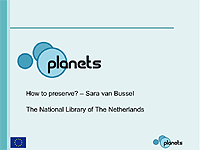 Annotated reading list of resources introducing the principles of digital preservation and how Planets helps to tackle preservation challenges. For each item, the format, extent and online location is specified, as appropriate. An alternative online location is also supplied, where available. 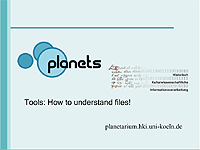 A set of technical summaries produced by Planets industry partner, IBM, providing an overview of Planets tools and services for technical support and developer staff. Online tutorial for the Plato preservation planning tool, providing an overview of the tool and guiding the user through the steps necessary to produce a Plato preservation plan. 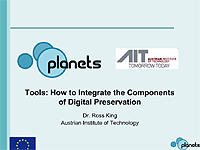 This material complements the support available at the Plato tool website.